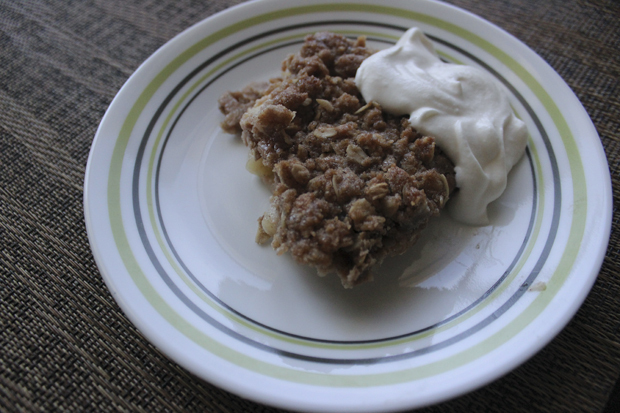 Today I was looking back through old blog posts and found this one from 2015 where I wrote that making apple pie with my mom’s recipes was one of my goals for before I turned 24. I totally forgot about that, but now I’m a few months away from 28 and I can say that I finally did it. I made apple pie using my mom’s recipe for French apple pie this past Sunday for her birthday. We had a small gathering and it seemed that everyone loved it. I’m so glad it came out good, but how could it not? 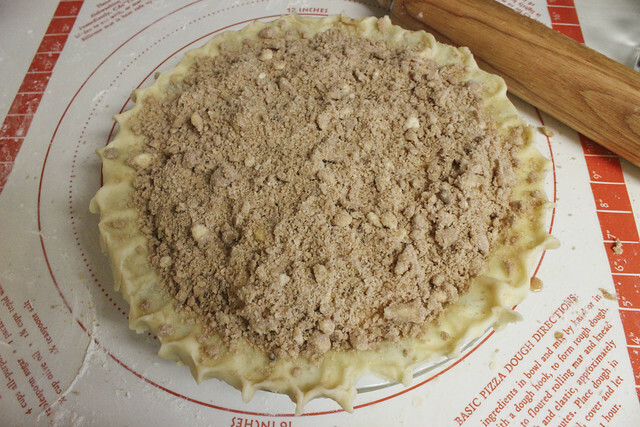 Apple pie is the best. I’m sure using the amazing Jonagold apples my husband bought us in Oak Glen made it even more delicious. I have a grandma who is not technically my grandma. She is my cousins’ grandma. But she is my Grandma Irene. I’ve called her Grandma Irene since the time I was a little kid. If you were to meet her she just might introduce herself to you as Grandma Irene too because that’s who she is. You see, she’s not technically related to me because she is my cousins’ grandma on their dad’s side and we’re related because our moms are sisters. It’s confusing to explain. She’s part of my family though. She’s smart and determined. She took college classes when her children were grown. She walks three miles just about every day. She’s giving and kind. She cares for animals, including injured birds and the dog she loves so much. 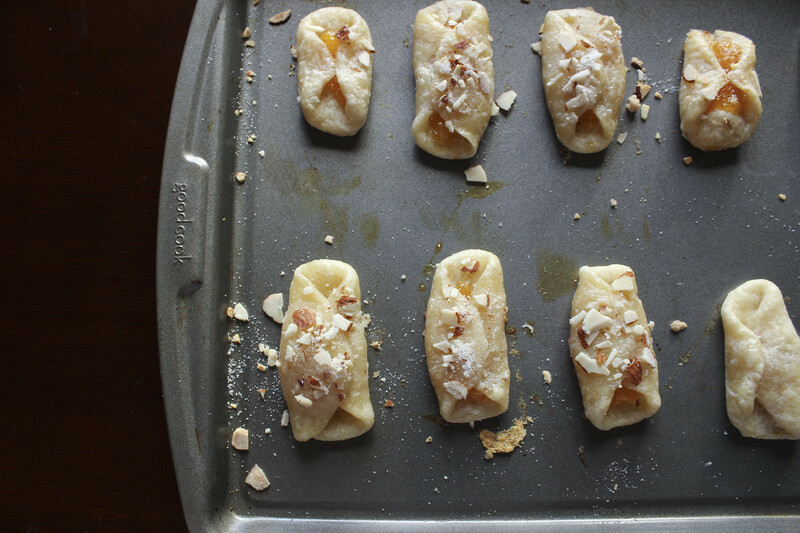 And just about every Christmas she would make these delicious apricot horn cookies. It’s almost Valentine’s Day and to celebrate I’m sharing an easy recipe for homemade candy that you can share with your love, your friends, or just keep to yourself. 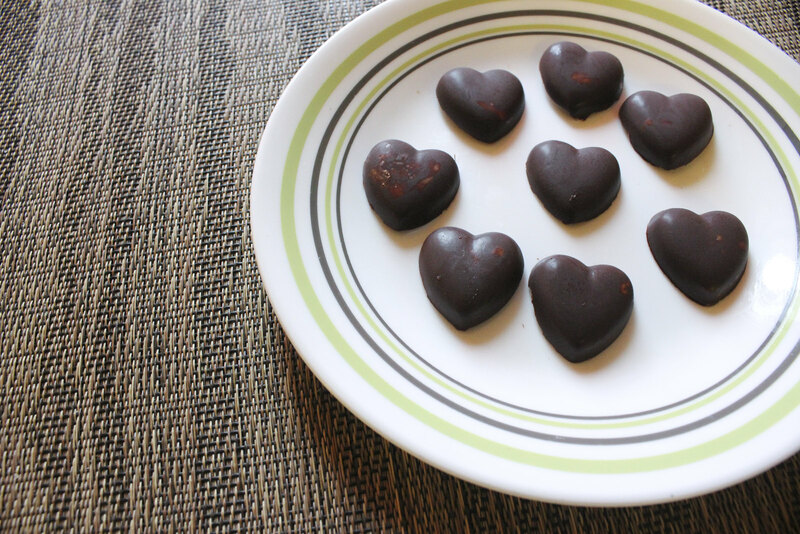 Paul and I both love chocolate peanut butter candies, so I made some festive chocolate peanut butter hearts. I kept it simple by only using four ingredients, but I think the end result is still impressive. When I was a kid, my grandma used to make these no-bake peanut butter cookies called “Gold Nuggets.” My sister Mary and I would love to help her make these. If I’m remembering right, we would usually make them in summer months because they don’t require an oven and therefore won’t heat up the house (even more). Last week there was a heat wave in Southern California, but I still wanted to bake something. I had the day off last Tuesday, so I took the time to prep everything except the oven. I picked out a recipe, followed the directions until baking time, and then stuck it in the fridge to be baked on a cooler day. By Thursday, it was in the 80s, so after work, I went ahead and heated up my apartment for a baked good in waiting. The night before I turned 25, I got an itch to bake something. I get those baking itches at least once a month. I feel like I just have to make something. I hadn’t planned on getting a baking itch, so I had to think on my feet. I looked around in my cabinets to see what ingredients were on hand for a fairly simple baked good. For the past few years, I’ve made this Devil’s Food Cake at some point during fall or winter. Well, I just looked back on the first blog post I did on the recipe and this year was only the third time but it feels like more. It’s my boyfriend’s favorite kind of cake. His grandma used to make a similar version for birthdays, so it has a special meaning for him. Plus, who doesn’t love cream cheese frosting? I’ve loved summer, but now that Labor Day is over I am so looking forward to the days when I can wear jeans and sweaters outside without sweating. I want to wear boots and tights with the oversize forest green jacket that’s hanging in my hall closet. I’m also hoping I can make it to the pumpkin festival at my school again this year and maybe even go apple picking in Oak Glen. I’m not much of a chef, but I love to experiment in the kitchen. I do this thing where I read a ton of recipes for something fairly easy and then try my own spin on it. Sometimes it works. Sometimes it doesn’t. The mistakes only make me learn and try again. Lately I’ve been testing out ideas for microwave bread pudding and I think I’ve nailed it. 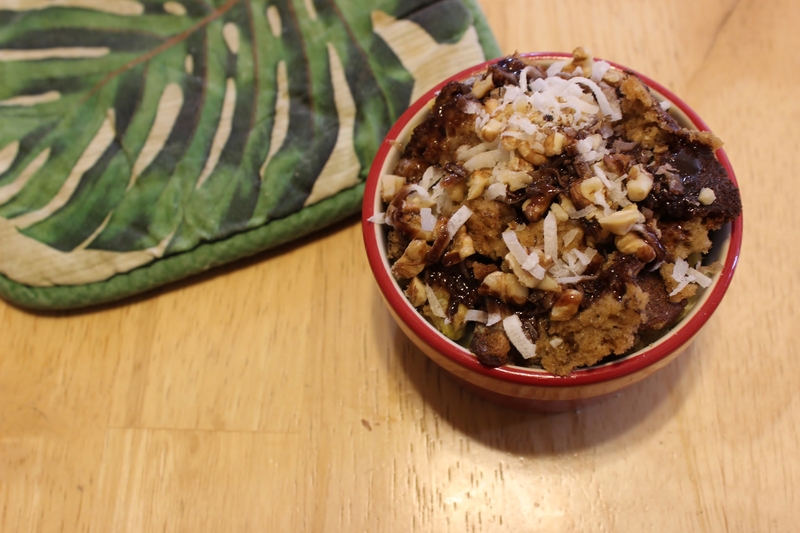 Making microwave bread pudding is incredibly easy, great for breakfast, and a delicious way to use up leftover bread. I don’t like food to go to waste. Last week, I made banana bread that was a little dry, so I wanted to re-purpose it in a way.